“That Lucky Old Sun” was first recorded in 1949 by Frankie Laine, followed by recordings that year by Vaughan Monroe and His Orchestra, Louis Armstrong and Frank Sinatra. Other recordings include those by Jerry Lee Lewis, Johnny Cash, Willie Nelson, Ray Charles and Sam Cooke. Tears all in my eyes? 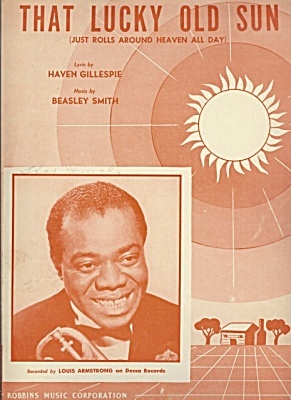 “That Lucky Old Sun,” a duet with k.d. lang, was recorded in March 2002 and released that same year on Tony Bennett & k.d. lang: A Wonderful World. Vocal arrangements were by Rob Mathes. The album was orchestrated and conducted by Peter Matz, with musical direction and arrangements by Lee Musiker.